…and other news. Here are a few stories that we’ve come across in the past few days that we think you might find interesting. We loved this one in particular. We all know about the life-enhancing lessons that kids take away from school (food) gardens. Well here’s another powerful way to engage them, help them learn, and improve their lives in the short- and long-term. The Leo Politi Elementary School, in one of the most densely populated areas of Los Angeles, removed 5,000 square feet of concrete and lawn and replaced it with native plants and trees. Amazingly (or not, as most gardeners know), insects, birds and other creatures appeared so quickly that the principal said it was almost as if they were waiting for this oasis to appear. Not only were the kids fascinated with the activity in their new habitat, but the school’s science scores increased six-fold. Anne Raver (one of our favorite garden writers) writes in the NY Times about a collection of garden photos taken from the late 1800’s to 1935 by Frances Benjamin Johnson. 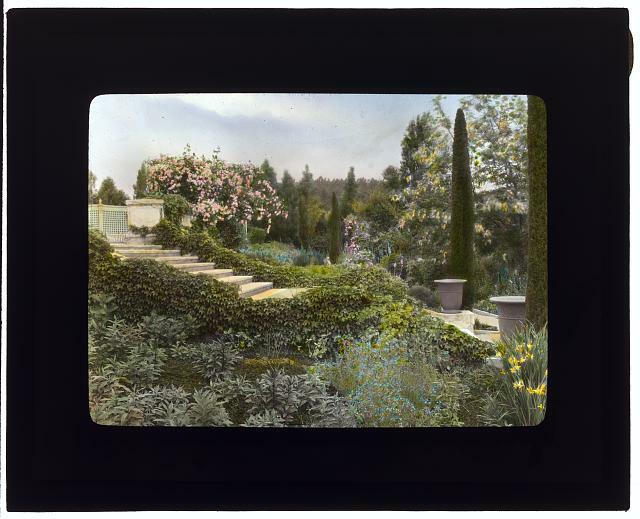 A catalog of her hand-colored glass lantern slides is available here. It’s a wonderful resource for anyone planning a new garden. “To gardeners, there is something deeply gratifying about opening a bag of sphagnum peat moss. It’s the smell and texture, as well as knowing that peat makes a good ground cover and soil improver. But, like so many other things in our lives, peat moss looks different, and far less gratifying, when you take climate change into account. What gardeners are buying in those compressed bags of peat is the remains of what was once a living bog. Extracting peat requires a kind of surface mining — laying back the top layer of a drained wetland and digging out the peat. The stuff you’re forking onto your garden is a broken-down version of stuff that has been used for centuries as fuel in Scotland, Britain and Ireland. Here’s the trouble. Peat results when bog and wetland plants decompose partially in the absence of oxygen. Instead of emitting carbon dioxide as they decompose, they become the carbon in peat. In other words, peat acts as a carbon sink, trapping carbon that would otherwise have been released into the atmosphere. But once peat has been dug up — even before it is burned or dug into the corner of the garden where you’re hoping to plant blueberries — it begins to release its stored carbon, adding to the climate-altering carbon dioxide we are already pouring into the atmosphere. P. S. Yes, we have been on an extended hiatus which was quite a bit longer than we intended, but we’re happy to be back. Tomorrow’s Tuesday’s Tips will be a primer on creating succulent terrariums. It’s super easy!